The shops are full of pumpkins at this time of year and rather wastefully many people simple use this great veg as a decoration and through the lovely flesh away! There are many great ways to cook pumpkin (pumpkin pie, pumpkin muffins, roasted pumpkin, pumpkin neepies and haggis), but my favourite is a warming spicy pumpkin soup. I'm eating some I made last night as I type - yum. Method - peel the outer skin of the lemon grass chop it into small lengths in put it in your whizzer. Add into the whizzer the chillies, garlic, ginger, cumin and five spice. Whiz everything in the whizzer. Put a splash of olive oil in the bottom of a soup pot and put on a low heat. Add the contents of the whizzer. Stir a little so it does not stick and enjoy the fragrances as they hit your face. After 5 mins add the onion and give it a good stir. Let it cook for a further 5 - 10 mins and then add in your pumpkin. Give it a good stir so the pumpkin gets covers with the mix that's already in your pot. After a couple of mins add in the stock and bring to the boil. Let it simmer for approx 15 mins giving the occasional stir. The pumpkin should be starting to go soft now and will break up when you stir. This is what you want it to do. Rinse your red lentil in a sieve under some cold water and then add to the pot. Give it a good stir. Leave for a further 15 - 20 mins, again giving the occasional stir. The last thing you want is the lentils sticking to the bottom of your pot and burning. Add your tin of coconut milk and stir it in. Taste and add salt and pepper to your taste. Let the soup come back to the boil for 5 mins and it's ready to serve. Hey if we can do it on a student budget, then most people can! Went to a party on Friday. Took a big pot of jambalaya which went down well. So here's my recipe. 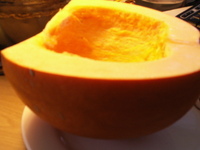 Dougie asks in my post on exciting shopping if I can share my recipe for pumpkin soup. If you know anything about me then you'll know that I love food and love spending time in the kitchen cooking up different things. I tried a different recipe for pumpkin soup last night and as it's simpler than the one I normally do this is the one I'll post up here. Boil up a fresh chicken carcase to make some good chicken stock. I normally leave it on arolling boil for 1 hour with a lid on. while the stock is boiling away you can prep your veg. Take 3 small / medium onions and chop up. take the hard skin off a small pumpkin and dice up the flesh. peel and chop some potatoes. I don't weigh things when making soup, I go by visual quantities, so you want twice as much pumpkin as potatoes. put a couple of ladles of the stock in a pot on a low heat and add the onions. It's important that it's on a low heat as you want the onions to soften slowly. Put a lid on the pot to keep all the juice and flavour in. Once the onion has softened (approx 5 mins) add the pumpkin and potato. Mix this in with your wooden spoon, and put the lid back on. Add plenty of freshly ground black pepper and a little salt. While the veg is sweating, ladle 1 pint of your chicken stock in to a jug. Add one chicken stock cube to boost the flavour. Add this stock to the veg and then add 1 pint of milk (I prefer full fat). Turn the heat up and bring to the boil then simmer for 45 minutes stirring frequently. After the 45 minuets remove this from the heat and let it cool. get a new pot and put three cups of long grain rice in it. I use plastic drinking cups from IKEA to measure this. Add 6 cups of chicken stock. Bring this to the boil. when all the stock has been absorbed by the rice take it off the heat and cover it with a lid. Blend the soup in a liquidizer then return to the pot. Add your rice and then gently reheat. the soup is now read to serve. you can vary this recipe by doing 50 / 50 onion and leek. you can also add a tub of natural yoghurt at the same time you add the rice to give it that extra creamy taste.